At present, users have option to choose from millions of mobile apps available at various app stores. So it becomes essential for each business to launch flawless mobile apps to get higher returns. While testing the application, the business needs to focus on its user interface (UI) as well as user experience (UX). That is why; the testers need to identify and avoid a number of mistakes which may affect the mobile app’s popularity and profitability in the longer run. Nowadays, a large percentage of users choose mobile apps based on their looks. Many users even download mobile apps without checking their features and functionalities in detail. So the user interface (UI) of the application will affect its popularity and profitability directly. That is why; it is important for testers to assess the app’s UI thoroughly and repeatedly. They can even allocate more time to test the UI instead of testing the application’s functionality. However, they also need to ensure that the app sports a clean and simple look, while enabling users to perform all tasks smoothly and quickly. The UI design can even include simple features like infinite scrolling and automatic spelling check to save a significant amount of users’ time. Many businesses nowadays build mobile web apps to make them accessible across multiple browsers. But the popularity of a mobile web application depends on its compatibility with major browsers. In addition to checking how the application performs across major browsers, the testers further need to identify the factors that affect its cross-browser compatibility. For instance, the cross-browser compatibility of a mobile web application may be impacted by its document object model (DOM) as well as specific add-ons, plug-ins, or scripting language. The testers must identify the factors that prevent the application from running on each browser smoothly. The emulators have made it easier for testers to assess the mobile app’s functionality and performance across a wide range of devices rapidly. But testers often forget that the emulators do not provide accurate information about the application’s performance on each device and network carrier. So they need to use real devices to assess how the app performs on individual devices and networks. The testers must balance the real devices and emulators in the testing environment to get more accurate test results and information. Also, they need to combine the emulators with various load testing tools to test the application under different conditions. The user experience delivered by mobile websites can be affected by bad and outdated links. There are also a number of factors that affect the quality of hyperlinks adversely. For instance, the changes made to the structure of the website or external resources can make certain links obsolete. Likewise, the quality of the links is also affected each time a document or web page is removed or replaced. But testers often forget to assess the quality of links while testing mobile websites. They can easily identify the broken or obsolete links by using a variety of tools. However, they must report all these bad links in the test report, along with mentioning the cause of each bad link. The user experience (UX) delivered by the mobile app determines its popularity in the longer run. But while testing an app, testers often focus on it functionality and performance, and ignore user experience. The stipulated time and resources also prevent testers from performing elaborate usability and user experience testing. The mobile app testing strategy of a business must focus extensively on usability testing. 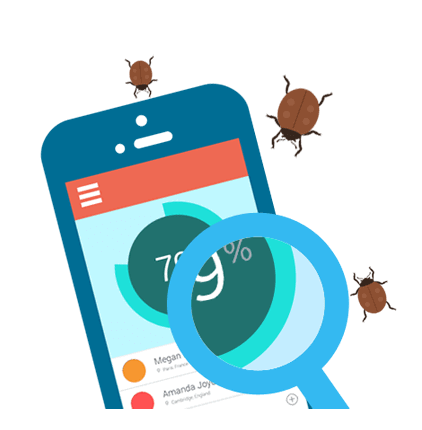 Also, the business must provide QA professionals with relevant tools to identify the bugs affecting the mobile app’s user experience. The tools will further help testers to get the bugs fixed effectively by providing detailed and relevant information to programmers. However, a single testing strategy must not be used for testing various mobile apps. The business must customize the mobile app testing strategy by keeping in mind the functional and non-functional requirements of individual projects. The custom testing strategy will further prevent the QA professionals from committing these sins.